Up until a year ago, I never liked oysters much. I thought of them as slimy, and the idea of ingesting something raw – not just raw, but still alive – was too much to bear. Sure, you can deep fry them, and pretty much anything tastes good coming out of the fryer. But why bother with oysters, when you can have chicken instead? That was the philosophy I clung to for the first several decades of my life. And then, a funny thing happened. We were killing time before a show at Mississippi Studios last spring. We’d parked ourselves at Interurban, a great little bar down the street with a private patio that boasts outdoor seating. A perfect oasis smack dab in the middle of the trendy Mississippi neighborhood. Our cocktails were tasty, and we were yearning for an appetizer. Something simple and light. For reasons still unbeknownst, I asked for a couple of oysters on the half shell. They seemed a good deal at $1.50 each, despite the fact that neither I nor my wife liked oysters. But there was no turning back now, no choice but to embrace this sudden adventurousness that had taken over mind, body and spirit. A few minutes later our oysters arrived tucked into their shells on a bed of ice, accompanied by a mignonette – a simple concoction of vinegar, shallots, and cracked black pepper. We weren’t even sure what to do with everything, but figured out we should squirt lemon juice over the oysters, top them with a little bit of the mignonette, and swallow in one fell swoop, trying not to think about what we were sending plunging down our throats. “Cheers,” we said, and clinked our oyster shells together before tilting our heads back and swallowing. To our utter amazement, the oysters were delicious. So good that we ordered a couple more. So good that we started ordering oysters on the half shell anytime we’re at a restaurant or bar that serves them. So good that we have since bought raw oysters, shucked them ourselves, and made a mignonette so we could enjoy them at home. So good that we gravitated toward oyster shooters next. Served in a shot glass and liberally doused with cocktail sauce, these are meant to be slurped down whole in one single swallow, much as you’d do with a good alcohol shot. So good that we have become oyster snobs, preferring Pacific oysters – which tend to be small, sweet and creamy – over the larger, milder and meatier Atlantic varieties. You can usually tell them apart just by looking at the shells. Atlantic oysters have smooth and deep shells, while Pacific oysters have rough, jagged shells that must be removed carefully if you’d like to avoid the sight of blood. So good that we have a favorite oyster variety: the Pickering Passage oyster, grown in the Puget Sound. Their taste is described as follows: “Their flavor begins with a mild saltiness, followed by what’s generally a full sweetness, and finishing with the fruity aftertaste common to pacific oysters.” Yum! Sometimes describing oysters is like talking about wine varietals. Other oyster favorites include the highly-prized Kumamotos, which are sweet, creamy – almost buttery – and have a cucumber-like finish; Olympia oysters, the only species native to Washington, with a sweet and unmistakably metallic celery salt flavor; and Pacific oysters, larger than most West Coast varieties, with a sweet and rich taste that reminds one of melons. When it comes to raw oysters, you’d be surprised at the subtle differences in flavor each variety has. Half the fun is in exploring. Pequids and Willapa Bay oysters are salty, Hog Island and Nootka Sounds are sweet, and Westcott Bay Flats are refined. Finding oysters in Vancouver can be a challenge, but McGrath’s Fish House features an oyster bar where you can order them on the half shell, as shooters, char grilled, and pan fried. It’s much less of a challenge in Portland, where places like Jake’s Famous Crawfish, Southpark Seafood, and Block and Tackle regularly feature them. But the best spot of all is probably Dan & Louis Oyster Bar, the oldest family owned restaurant in the Rose City. They’ve been shucking oysters since 1907, and are still going strong! Our first oyster experience. 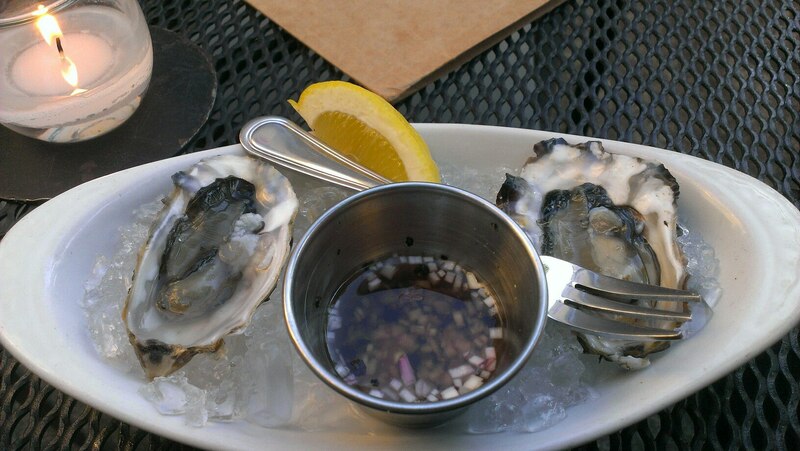 Served on the half shell with mignonette at Interurban.